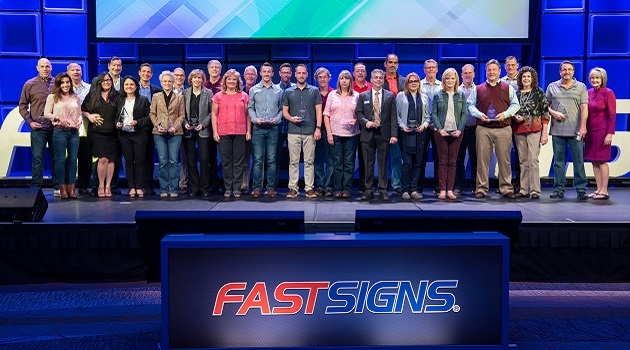 FASTSIGNS® of Columbia – Harbison Blvd, a local sign and visual graphics provider, was recognized as a top performing center at the 2019 FASTSIGNS Convention held in Orlando, Florida. Owned by Gerry Brossard, FASTSIGNS of Columbia – Harbison Blvd received the Pinnacle Club Award, which is given to centers ranked 26 to 125 in sales volume between Oct. 1, 2017 and Sept. 30, 2018. “We appreciate our customers’ support and look forward to helping companies of all sizes with the custom signs and visual graphics they need to get noticed, tell people what they do, help visitors find their way around a location and so much more,” Brossard said. FASTSIGNS of Columbia – Harbison Blvd has been in operation since 1994 and was purchased by Gerry Brossard in 2000. FASTSIGNS of Columbia – Harbison Blvd is located at 252A Harbison Blvd. and is open Monday through Thursday from 8:00 a.m. to 5:00 p.m and Friday from 8:00 a.m. to 3:00 p.m.